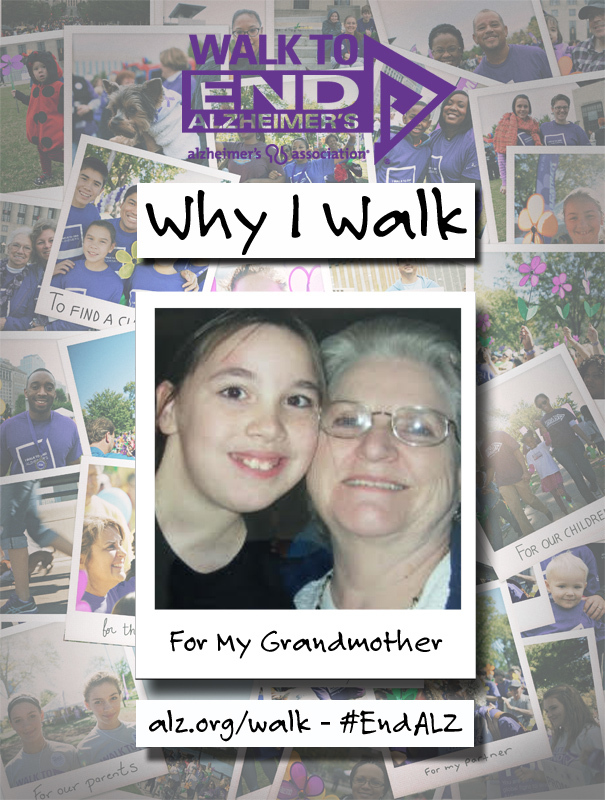 My name is Brittany Eckstein and I Walk to End Alzheimer’s for my Grandmother. In 2007, when I was just 12 years old, my Grandmother was diagnosed with Alzheimer’s. I was old enough to know what it was, but too young to know how bad it could get. In the beginning stages, little things would slip such as names and places. It progressively got worse and eventually got to the point where my Grandmother could not live on her own. In 2009, she came to live with my mother and me and we took care of her for about two years. Eventually, it became too much for us to handle, so my aunt took over the caregiving. We would go over to visit and to check up on her and I even spent an entire summer with my Aunt helping her take care of my Grandmother. It was hard to watch her not remember who I was, but deep down I knew that she would never forget me no matter how bad the disease got. She eventually got to the point where she could no longer speak or walk and the family placed her with Hospice. She was only given a year or so to live. I remember visiting her one day and as soon as I walked in the room she gave me the biggest smile. It had been a long time since I had seen her smile that way. That’s when I knew that deep down, she still knew who I was and that she wouldn’t forget me. That moment gave me hope. She was in Hospice for two years before she passed away. My Grandmother was a strong fighter and continued to surprise the doctors every day. When she no longer had the strength to fight, she let go and passed in July 2015. So, I Walk for her. My grandmother was one of the strongest people I have ever known. She was always a fighter – before and during her fight with Alzheimer’s. I Walk to let people know to not give up hope. I Walk because I know one day, we will find a cure!!! 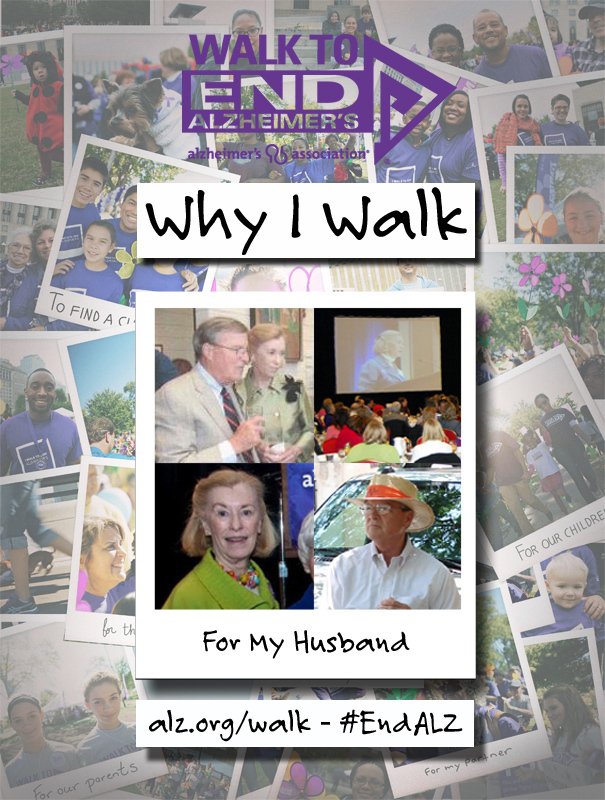 My name is Fran Zehmer, and I Walk to End Alzheimer’s for my husband, Jack. More than eleven years ago my husband Jack was diagnosed with dementia. He was 62. Jack was an author and avid traveler and had just retired from a career as an architectural historian and was looking forward to having time to complete several books and take a number of trips. The progression of the disease made finishing the books a growing strain on him, and the possibility of the trips disappeared. 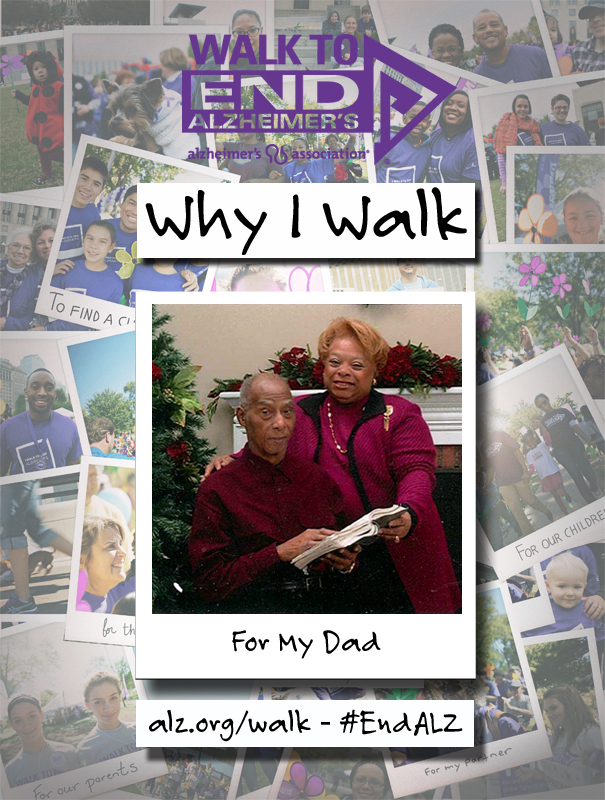 As a couple, we turned to the Alzheimer’s Association Greater Richmond Chapter for guidance, attending the organization’s support group meetings and gathering vital information about the disease. Because of the Association, we both learned how to navigate the potholes in the long road of memory loss and with the Association’s help it became very clear that until a cure is found, countless other couples will have to face what we are facing daily. Finding a cure will take extensive research. Extensive research takes money. Until a cure is found, more support for caregivers is vitally needed. Funds are needed for respite care and educational resources that can help caregivers better handle the unpredictable challenges that may face them. So I Walk to help raise funding to find a cure. 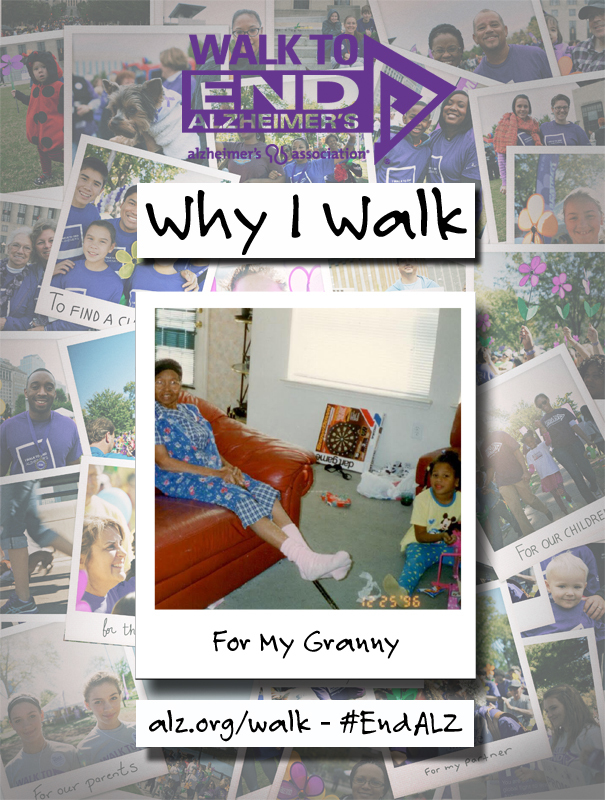 I Walk to help fund support for other caregivers in their unpredictable journey. And I Walk for Jack, who I am sure would not have wanted the evaporation of his mind to have happened. 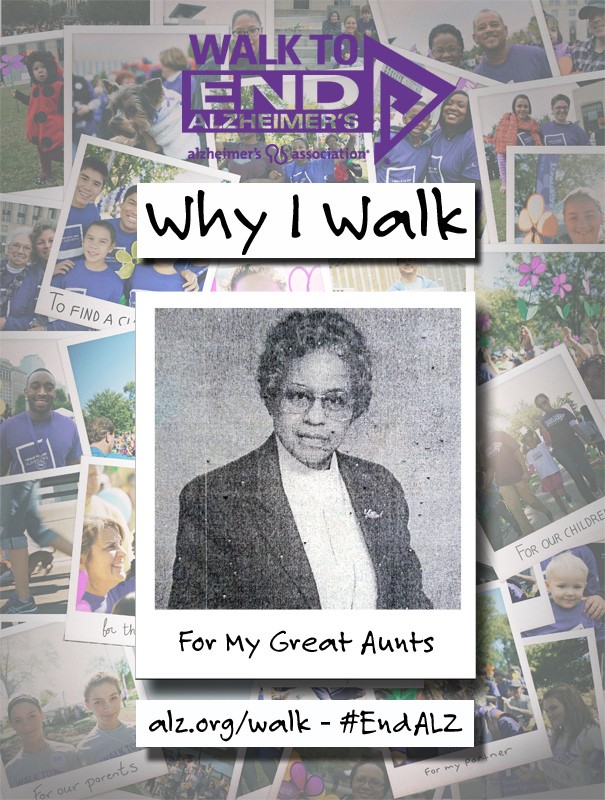 My name is Ryan and I walk in memory of my great-aunt Eva and to find a cure for her sister, my great-aunt Bea (Beatrice). I remember growing up and going to visit Aunt Eva; she knew her way around the kitchen and made the best brownies and always set aside a tin just for me, no nuts if you please. 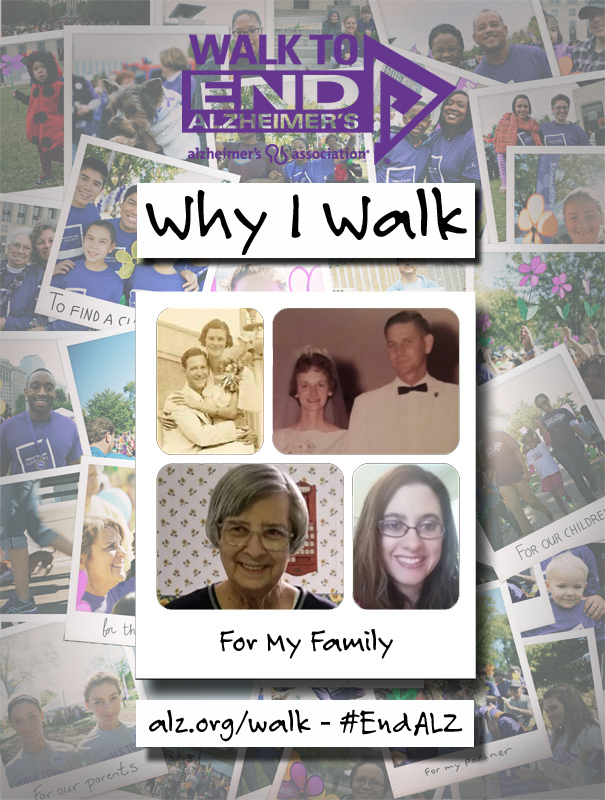 At the time of her diagnosis, my family was unaware of the support and resources provided by the Alzheimer’s Association. Since joining my local chapter as a volunteer, I’ve made it my mission to share my experiences and involvement with the chapter in an effort to help others; it seems as though everywhere I go, I meet someone who has been touched by this devastating disease. My great-aunt Bea has been recently diagnosed, and though the news of her diagnosis is sad; she is still just as sharp and quick-witted as ever. Please join me and thousands of other Central Virginians in our effort to raise awareness and funds to combat this terrible disease. 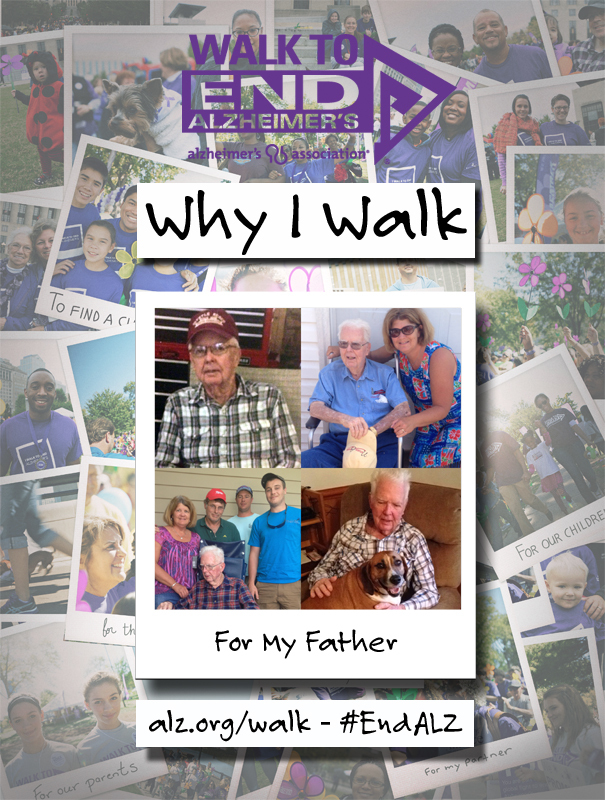 The Alzheimer’s Association is the brains behind saving yours; join us in the fight to end Alzheimer’s!